If you’re a regular reader on here, you already know that I like to party. If you’re not a regular, WELCOME, and now you know! I’m very used to nights out in London. Drinking Crack Baby’s in Boujis, mingling in Maddox and dancing in Project. The night normally starts when I would get home from work at about 8pm, a quick bite to eat, friends come over, pre-drink on sparkling rose, get ready and away we go. Going out on an island couldn’t be more different. After spending the entire day on the beach, you go home (only when the sun is no longer in the sky), shower, throw on some shorts and a t-shirt, try and tame your hair, whack on a bit of make-up (if you can be bothered) and then off out to dinner. I didn’t quite get it right the first night. Yes, I was the girl tottering along to the beach bar in my wedges. In Monaco, I would have looked the part. But in Thailand, people were betting on how quickly I would fall over rather than admiring my beautiful shoes. The shoes were promptly removed and placed behind the bar, so I could dance on the tables. So you don’t make the same mistake, here are the (unofficial) rules of the beach. 2. Don’t bother with a full face of make-up. Unless you’re the Ice Queen, it will only melt off as soon as you leave home. 4. Don’t plan the night, pick a bar and go with it. Now you know the rules, lets put them into action. After Polly consumed a tuna and cheese pancake, (we did tell her that was wrong from the start) it turned against her and gave her a terrible dose of food poisoning. We had no choice, but to try and make up for the fact that we had lost one of the pack. The boys also lost a few of their wolf pack that day, down to just Ben, Lee, Will and Graham (we comforted them as best we could). We arranged to meet up with the guys at the Reggae Bar, also known as the Thai Boxing Ring. Thai men walk around holding signs encouraging guys (or girls) to fight each other, with a free bucket for the winner. Whatever you do, DO NOT get in the ring with one of your friends. These fights get nasty. 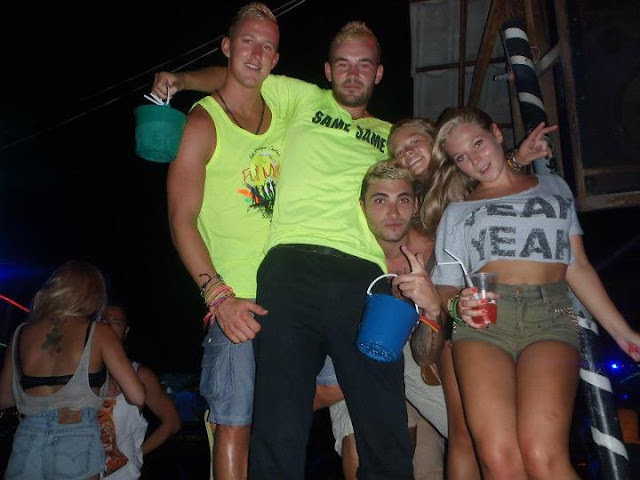 After a few drinks there, we would head over to the Banana Bar for a spot of Beer Pong and their amazing Daiquiris. Will and I are still the reigning champions. The Irish Bar, opposite Banana Bar, is also a popular favourite among tourists. However, their lack of Beer Pong tables didn’t entice us. Slinky would be calling us before we’d finished the game, and we’d find ourselves dashing off to the beach to dance the night away. If you couldn’t find us at Slinky, we’d be at the next door neighbours; Woody’s. Now, as a word of warning, Slinky has a wooden pole at the front of the dance floor. When everyone’s had a bit to drink, they seem to think they’re invincible and climb the pole. After climbing the pole, you can either climb back down, or jump. *FYI, the latter of the two is the least sensible option. * I watched in horror as a guy attempted to crowd surf. Instead his swan dive took him too far from the waiting arms and he ploughed, face first, into the dance floor. Not pretty, the music cut and the crowd fell silent around him awaiting someone to do something. After about five minutes, the guy started to fist pump and there was a cheer from the crowd as the music started once more and he was carried away by friends to be seen to. -Island life eh? (from left to right) Ben, Will, Lee, Harrie and me. The music stops at the ridiculously early time of 2.30am, and everyone slowly empties the beach. Generally the crowd separates and spreads across the island. We could normally be found indulging in mid-night mid-morning snacks along the way, a tub of chips would always be enough to hit the spot and send us off to the land of slumber.